The EFX 5.25 elliptical trainer from Precor is built around their patented CrossRamp technology which allows you to adjust the incline between 15 and 25 degrees without getting of the machine. Not only does the steeper incline provide a more strenuous workout, but it also targets different muscle groups at different inclines, incl. glutes, quads, hamstrings and calves. A stride length that is variable from 18” to 20” lets you optimize to your preference and makes it suitable for just about any user height. Unlike some brands, you can reverse the direction of the elliptical motion, adding even more variety to your workout. This being a Precor, the EFX 5.25 provides a stable, smooth and quiet ride; footpads are large and comfortable. 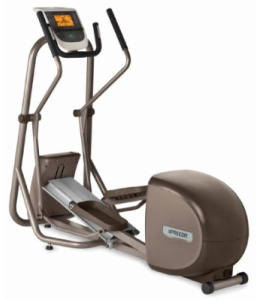 While it is not a compact unit, it has the smallest foot print in the Precor lineup. A locking pin secures the pedals when not in use, a helpful feature around little children.Separate handlebars add an upper body workout and embedded touch sensors lets you track heart rate via the display. The display is backlit, especially a benefit in low light situations. Choose between 8 pre-programmed exercise routines and 16 resistance levels. Personal work out data can be stored for 2 different users. There is a storage shelf for Ipod/MP3 player and a water bottle. Reflecting how confident Precor is in their products, warranty is an excellent 10 years on parts, one year on labor. As for all Precor elliptical trainers, this is a well built, quality machine, well suited for someone looking to buy a premium unit, with reviews consistently very high.